Coleus is also known as flame nettle or painted nettle. It is an excellent choice to brighten up areas in part to nearly full shade. This plant, although widely used as an ornamental annual is actually a tropical herb, grown primarily for its colorful foliage. Coleus can be grown successfully in a sunny location, but they prefer more subdued light conditions. Plants do well when planted in a good potting soil in pots or containers such as window or patio boxes. They also blend or contrast beautifully in a woodland setting together with ferns or hostas as well as impatiens and other shade loving annuals. Leaves, stems and flowers somewhat resemble the growth and texture of common stinging nettles including the pale blue flower spike and toothed leaves. 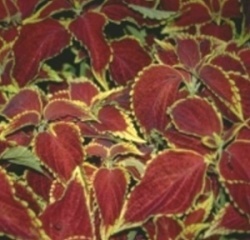 However, instead of just plain green, coleus foliage colors range from solid pale green through deep maroon with vibrant contrasting variegations and markings in shades of white, yellow, orange and pink. Coleus grows quickly (even from seed) and makes a lush bushy plant up to 18 inches tall. These are thirsty plants. Water often enough to keep the soil moist, especially during hot dry spells. They will let you know when in need of water by drooping or wilted foliage. The secret to maintaining longer life and promote dense growth is to pinch or prune often and cut off flower spikes as they develop. If you grow your coleus well and inspect regularly, they develop few problems. Aphids, spider mites and mealy bugs like coleus but can be controlled easily when caught early before they can infest the plants. It is easy to increase your coleus collection by taking 3 to 5 inch tip cuttings any time during the growing season. Cuttings will readily put out roots in water or moist seedling mix in about 5 to ten days. If you take cuttings at the end of the season, you can pot them up and keep them growing inside over the winter months. This will give you a head start in spring when you can plant them out after danger of frost.